I think everyone has that corner in their bedroom that we all kind of neglect and ignore. I’ve had a bland corner in our master bedroom since 2012 when we completed the renovation and subsequent accent wall change. 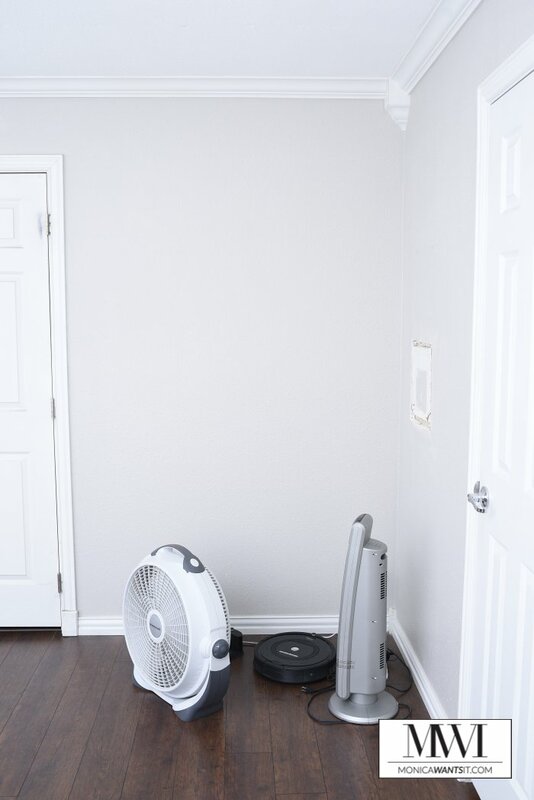 It’s been a dumping ground for shoes and laundry, plus it also holds a fan (I can’t sleep without the white noise), our Roomba and a heater in the winter. That’s why I jumped at the chance to collaborate with Sauder on this bedroom corner makeover. I’m thrilled with how it turned out. When thinking about what I wanted the corner to look like, I had to step back and think about what I would be doing in that space. The look of a space is important, definitely, but more so is its function. A pretty space without a purpose is a wasted space. It’s our master bedroom, so ideally I wanted a large, cushy chair to sit and put on my shoes or write in my blog planner when I get those random late night ideas. In a master bedroom it’s easier to go for larger statement pieces since the room tends to be larger—it’s all about scale. 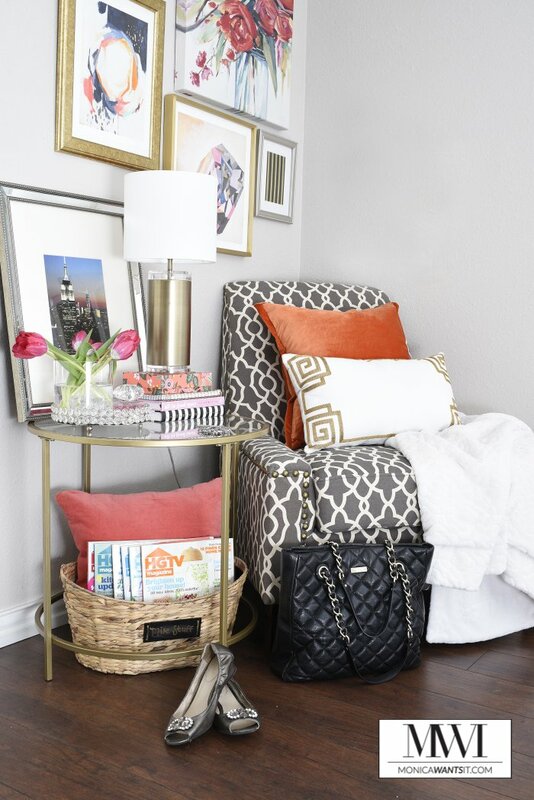 In a smaller bedroom like a guest room or kid’s room, I’d choose something smaller, sleeker to keep the sight lines open— like the Ellis Accent Chair I put in our guest room. Eventually, I found the Nico Accent Chair by Sauder that checked off all the must haves on my list. 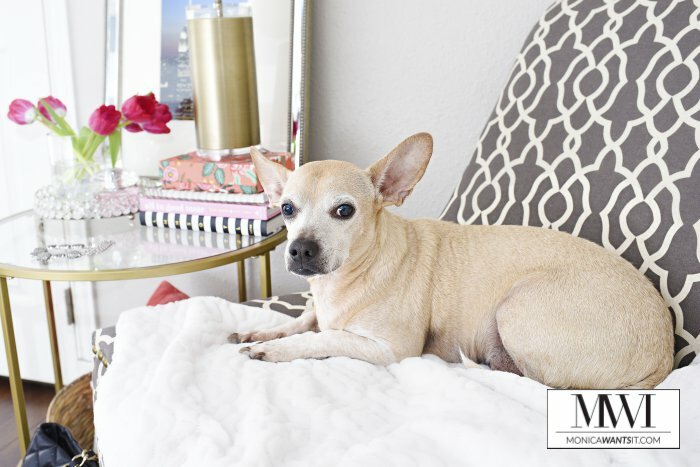 The chair is large, has a wide soft seat that even Pee Wee can sprawl out on, plus the brass nailheads add a sophisticated, timeless quality to the chair. I couldn’t have asked for a better color or pattern—it matches with nearly any color or décor scheme. The fact that it’s armless makes it sleek and modern. I also wanted a side table to pair with my Nico Accent Chair that could showcase fresh flowers, a small lamp for nighttime work (in the daytime, the sliding doors let in plenty of light), books and some artwork. But the side table also had to be large enough to hold my laptop so I could quickly check emails in the morning. I do not like my side tables to be heavy visually since most of my rooms already have large furniture such as our bed, dark nightstands and our mirrored media stand. Also, I like to find side tables that allow for something to be stored under them to give me extra storage space. 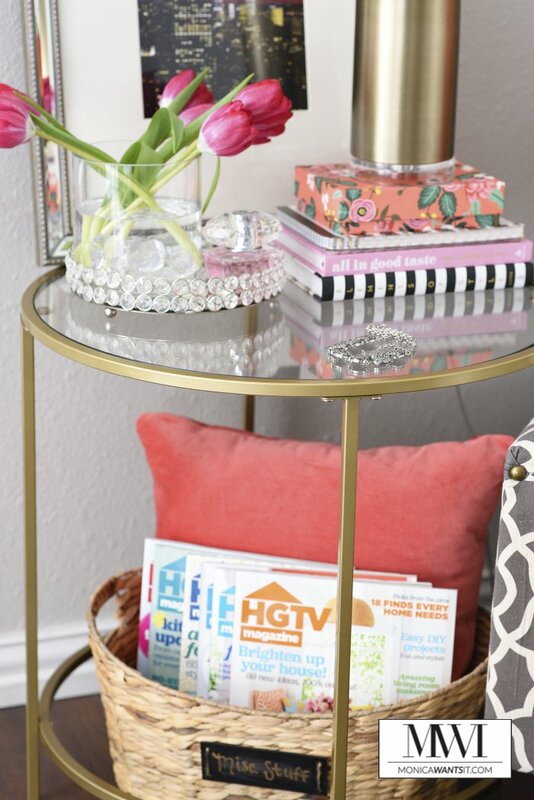 The International Lux Side Table was my top choice because I absolutely love the coffee table version of it that I’ve had since last fall (see that makeover here– it’s pretty). The gold finish makes my heart sing…as you all know, I love me some gold furniture! The glass top is big and glam, and it holds the things I need and my pretty décor. A huge bonus is that the bottom is open, so I can fit one of my large baskets under there to store magazines, pillows, throw blankets or Pee Wee’s toys. When mixing and matching furniture, I like to tie the furniture pieces together both in scale and color. In this case, the International Lux Side Table is the perfect height for the armless Nico Accent Chair, and the gold finish is a nod to the brass nailheads. Glass tables are so easy to mix and match with nearly any chair, so it’s a fail proof option when decorating. And as you can see, I also took this opportunity to create a gallery wall, which helps add a bit of oomph to the corner. I love how it turned out! Make a list of what you will want to do in the corner: check emails, drink coffee, read the paper, watch TV, etc. 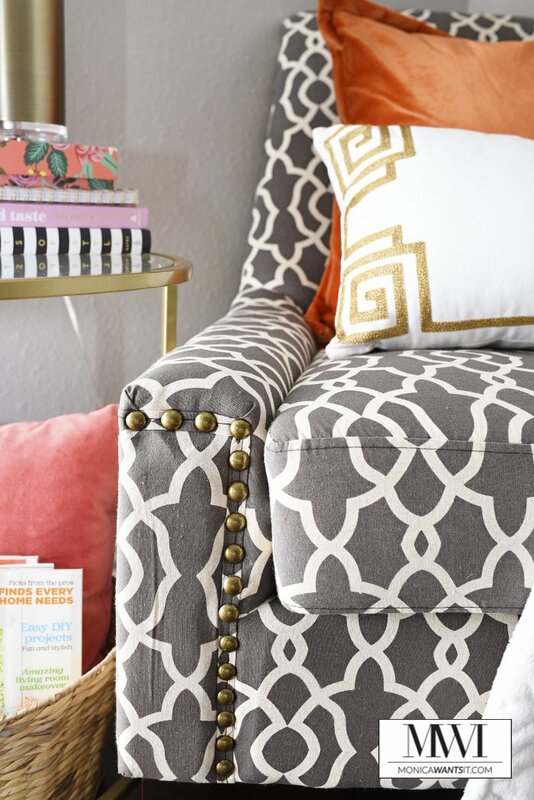 When pairing furniture together try to find at least one common thread: color, scale/size, finish or pattern. 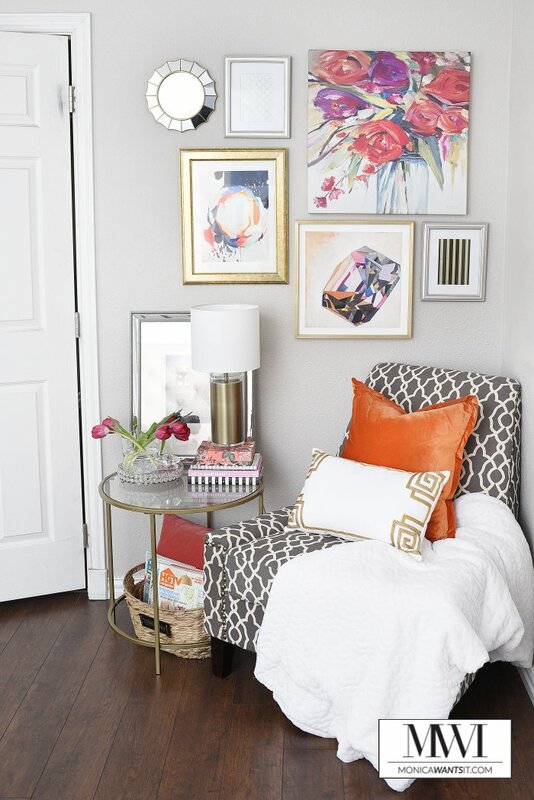 Once you have your furniture in place it’s time to add décor: artwork, throws, blankets, pillows, lamps and mirrors will make any corner more beautiful. 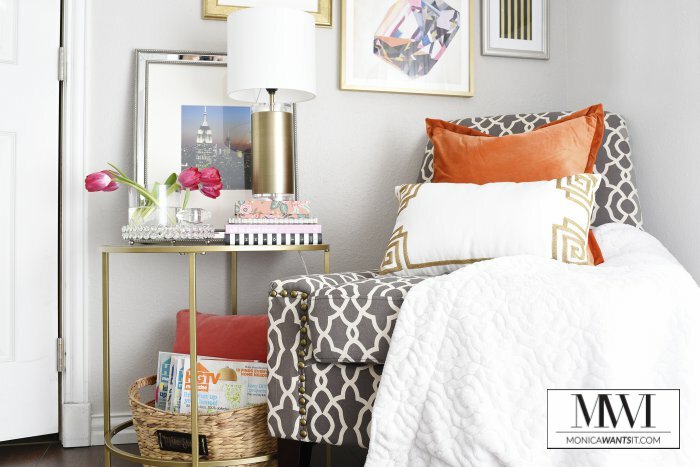 What are your tips for creating functional and beautiful corners in bedrooms? How about a desk for a home office or a recliner for reading? I was provided compensation and product for this collaboration with Sauder. All opinions are my own. Hi, Monica. Thanks for sharing this nice post. See how beautiful your chair is? Not only me, it seems that your doggy also likes the chair. I love this little corner. It is colorful and functional! Love it! How beautiful! I love your chair. This looks like the perfect corner to snuggle in and relax. Beautifully done.